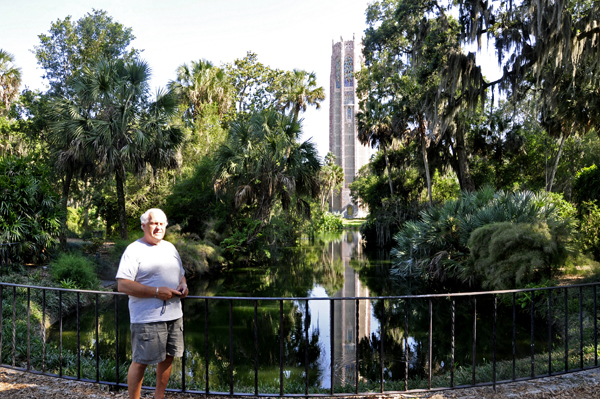 The Two RV Gypsies went to Lake Wales, Florida and explored Bok Tower Gardens, a National Historic Landmark. 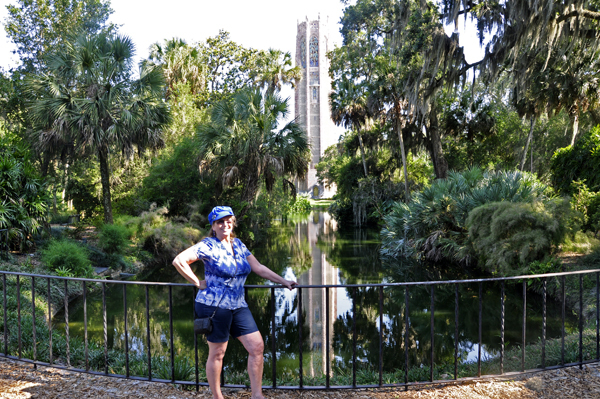 Bok Tower Gardens, through its historic landscape gardens, unique Singing Tower Carillon and magnificent 1930s Mediterranean-style mansion, offers unparalleled opportunities for artistic, cultural, personal and spiritual enrichment. 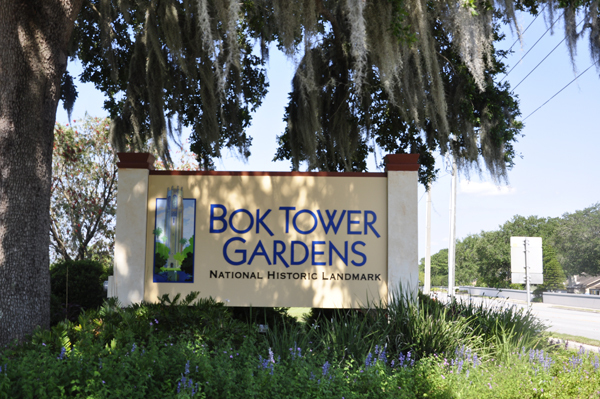 When Bok Tower Gardens founder Edward W. Bok immigrated to America from Den Helder, Netherlands at age six, he did not understand the language, customs or culture. 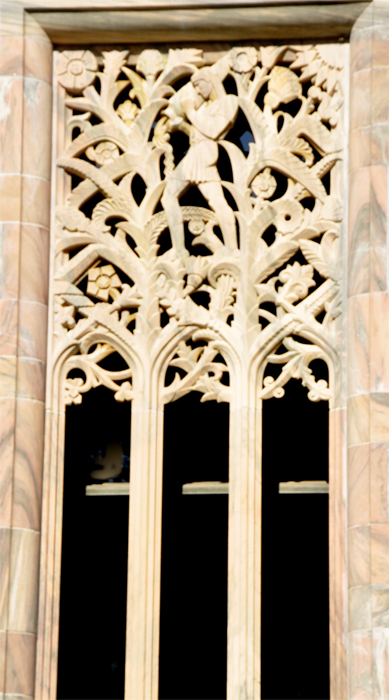 Through determination and hard work, he became a highly successful publisher, Pulitzer Prize-winning author, respected humanitarian and an advocate of world peace and the environment. 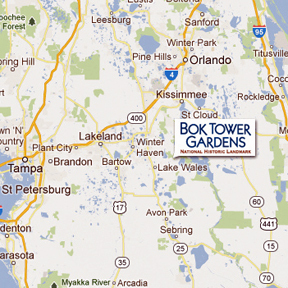 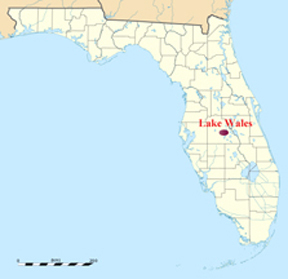 During visits from their Pennsylvania residence to their winter retreat near Lake Wales, Florida, Mr. Bok became enchanted with the beauty and vistas from nearby Iron Mountain. 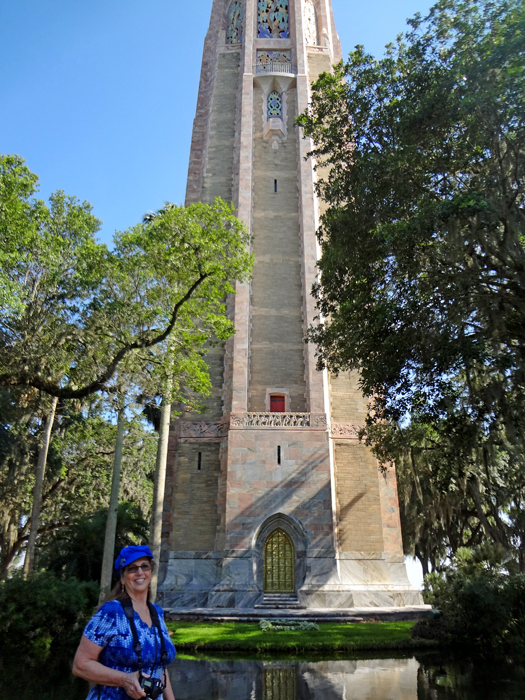 At 298 feet above sea level, one of peninsular Florida’s highest points, Iron Mountain offered views of dramatic sunsets. 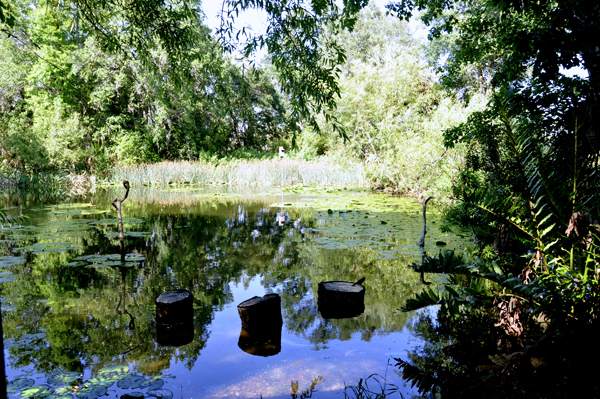 Awed by the tranquility of the area, he wanted to create a place that would “touch the soul with its beauty and quiet,” and chose it as the perfect setting for a bird sanctuary. 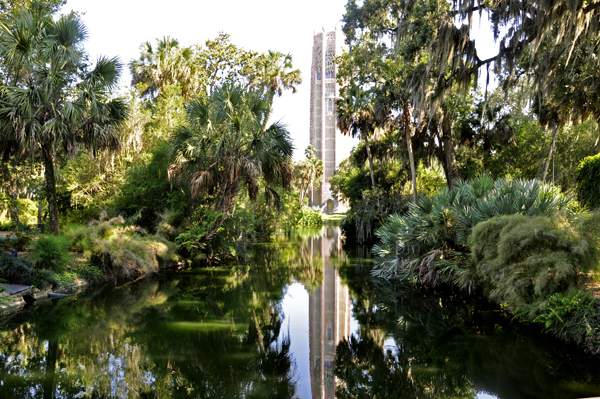 He purchased land to transform into a sweeping landscape of lush gardens featuring a majestic Singing Tower housing a 60-bell carillon. 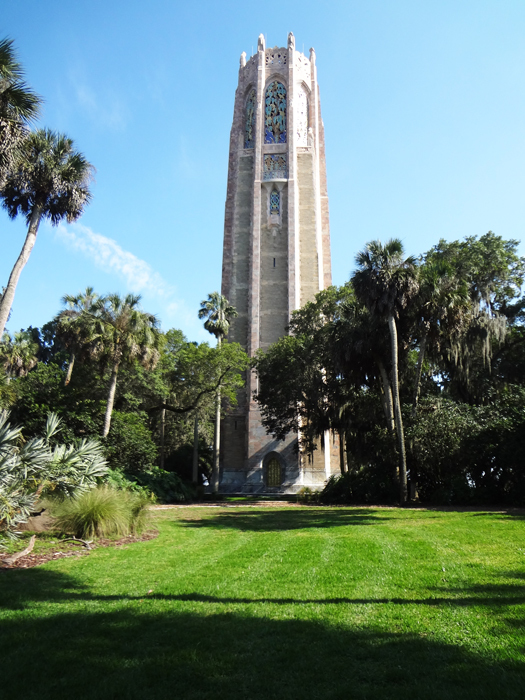 Originally called Mountain Lake Sanctuary and Singing Tower, he presented this extraordinary gift to the American people February 1, 1929 as an enduring token of his appreciation for the opportunities he had been given. 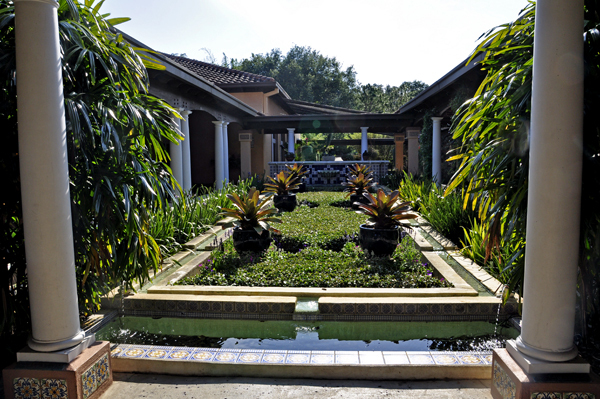 The entry area leading to the visitor center and gift shop at Bok Tower Gardens with fantastic Bromelaids. 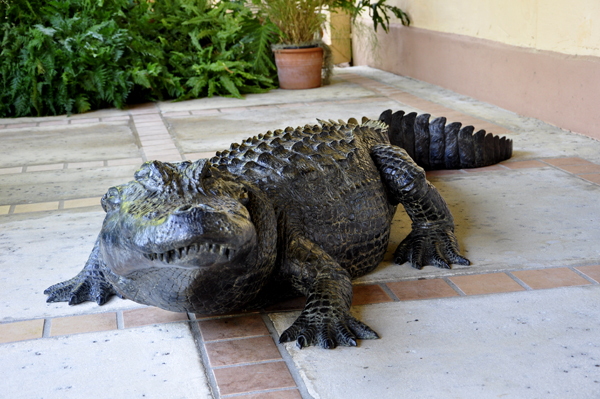 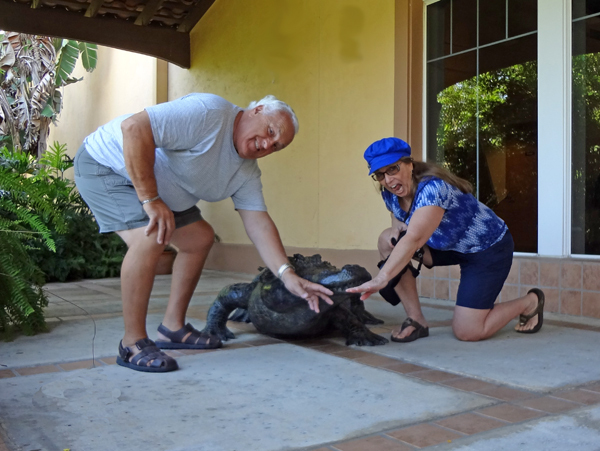 The two RV Gypsies got bit by the alligator outside of the gift shop. 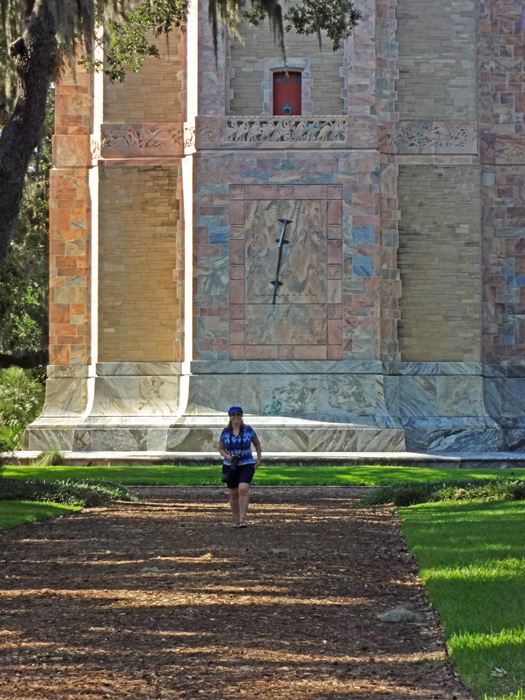 The two RV Gypsies walked throughout the grounds of the Bok Tower Gardens on The Pine Ridge Nature Trail, a 3/4 mile paved walk through the native longleaf pine-turkey oak habitat. 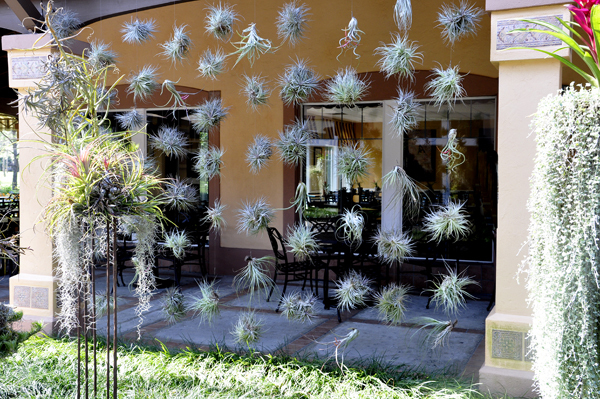 Their first stop was the "Window by the Pond" - a building where wildlife could be seen through the windows, yet the wildlife could not see inside the building. 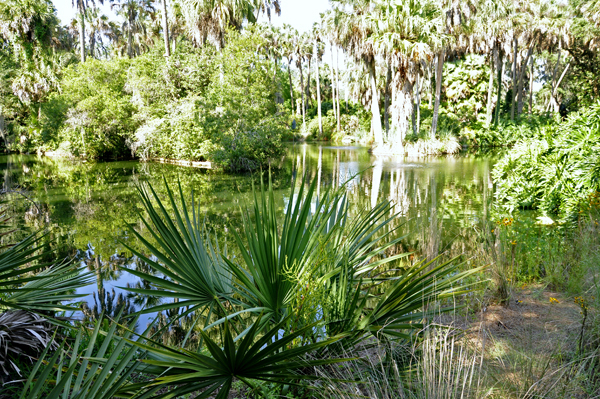 The pond was beautiful, and they saw lots of squirrels and birds. 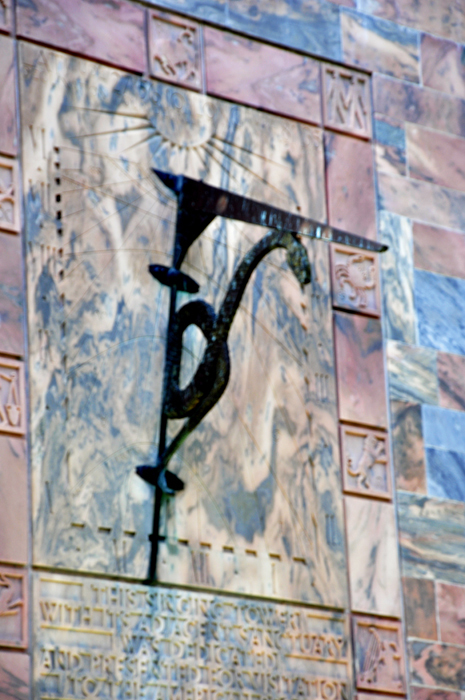 The marble Exedra shown below was a gift to Edward Bok from friends. 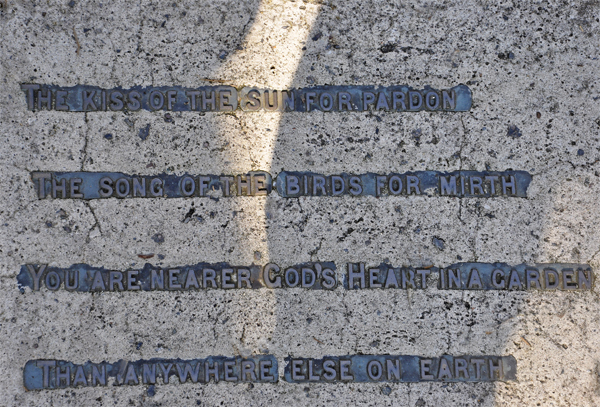 Below is a close-up photo of the inscription in the above Exedra. 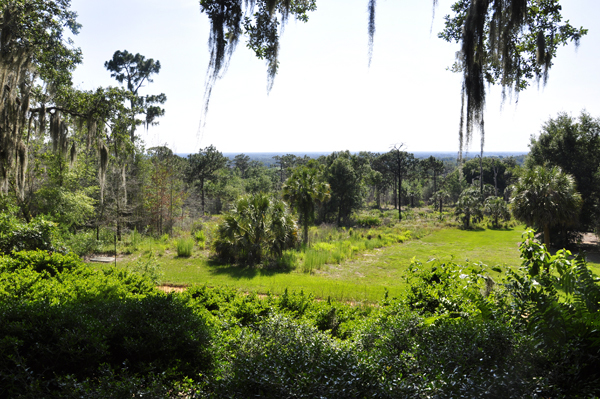 The sunset view shown below inspired Mr. Bok's dream of the Gardens during his visits to Iron Mountain. 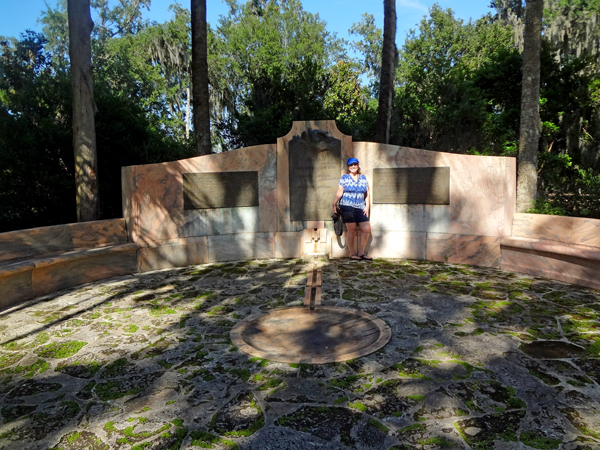 At the elevation of 298 feet, this is one of the highest points in Peninsular Florida. 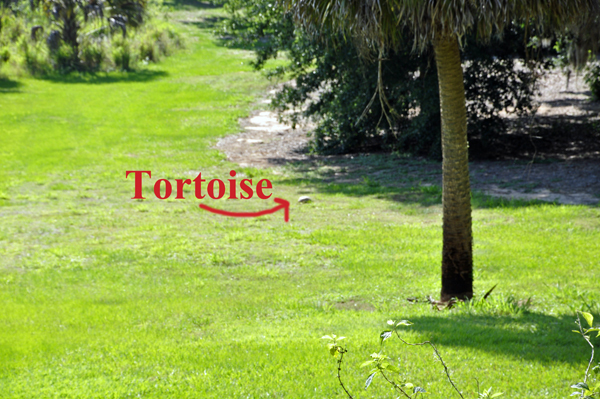 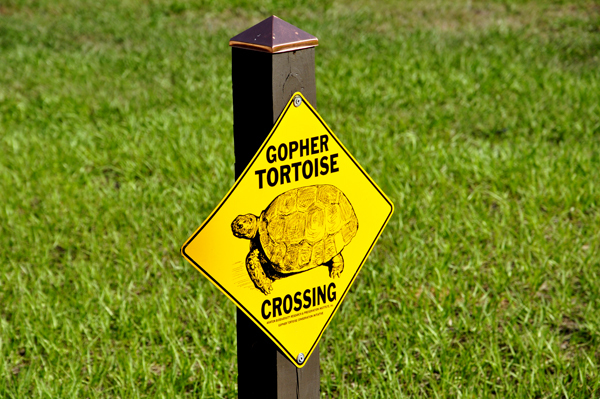 From this lookout area next to the Exedra, Karen zoomed in on a gopher tortoise. 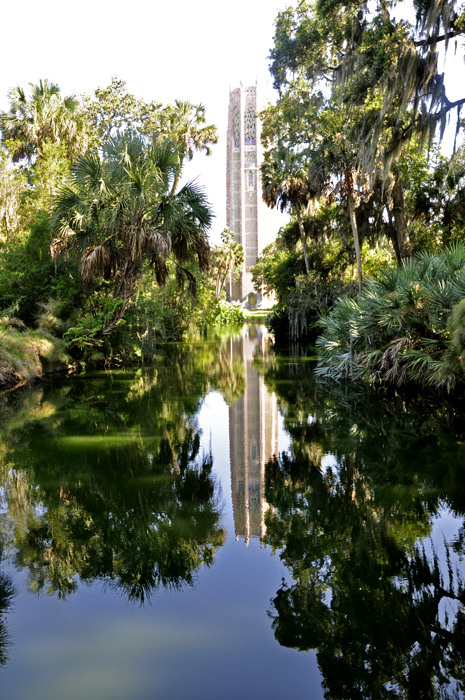 Just behind the Exedra is an area known as The Reflection Pool, where the two RV Gypsies got their first look at the Bok Tower, plus a fantastic view of a mirror reflection of the Bok Tower, also known as the Singing Tower. 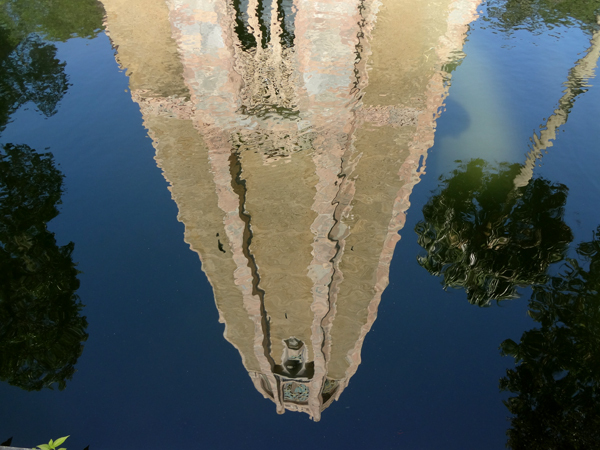 Below is the view as the two RV Gypsies stood on the other side of the above pond, with their backs towards the Singing Tower. 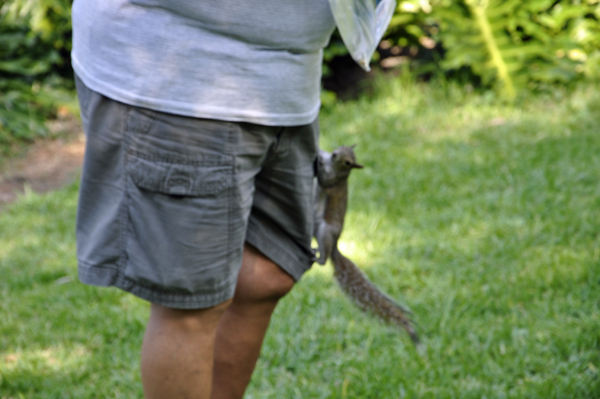 As Karen was taking the photo shown above, Lee yelled out, "there's a squirrel climbing on me." 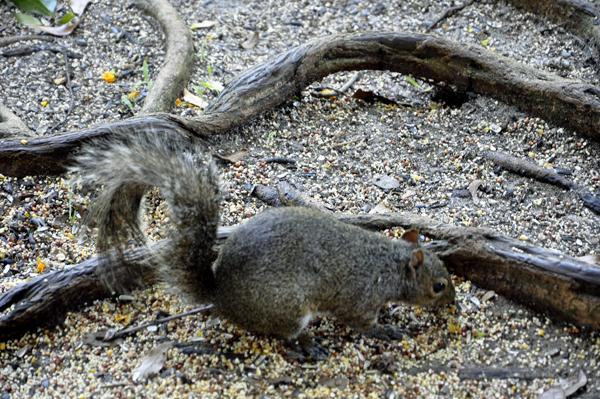 Karen quickly turned around and snapped a few quick photos. 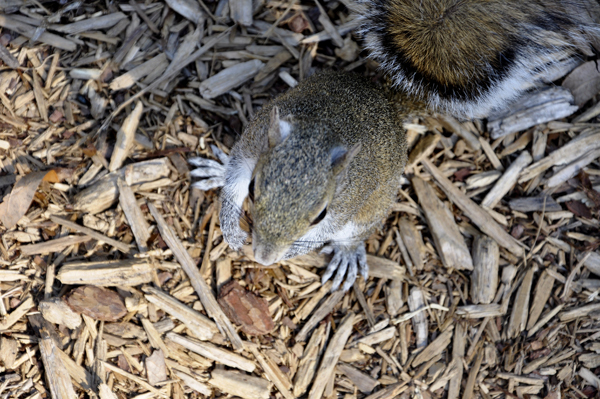 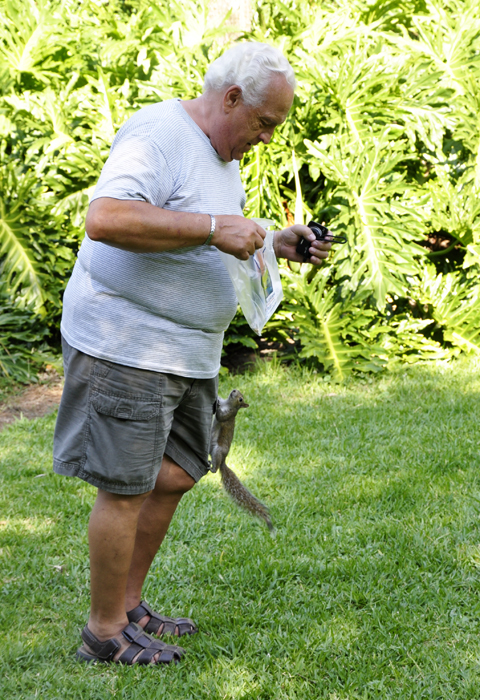 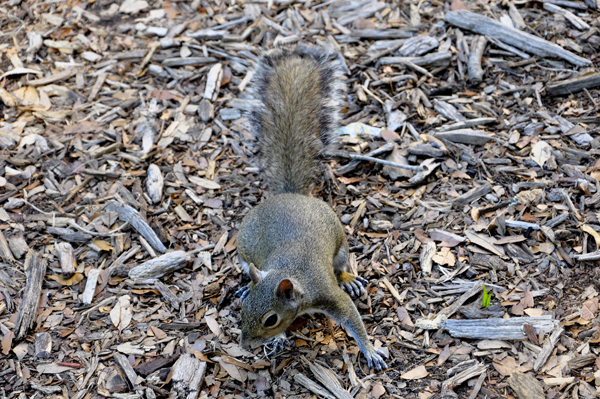 Lee was carrying a bag with his purchase from the gift shop and the squirrel must have thought there was food in the bag. 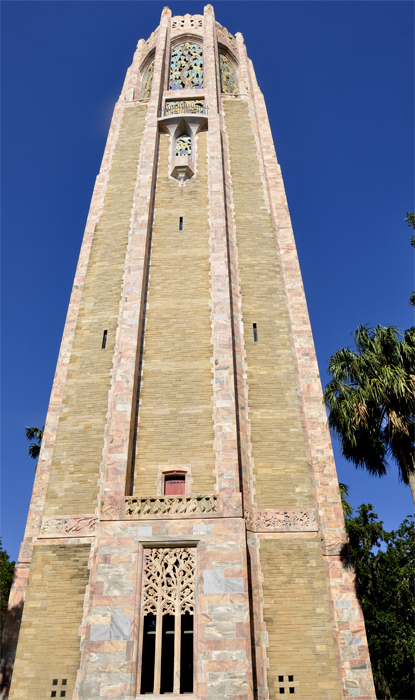 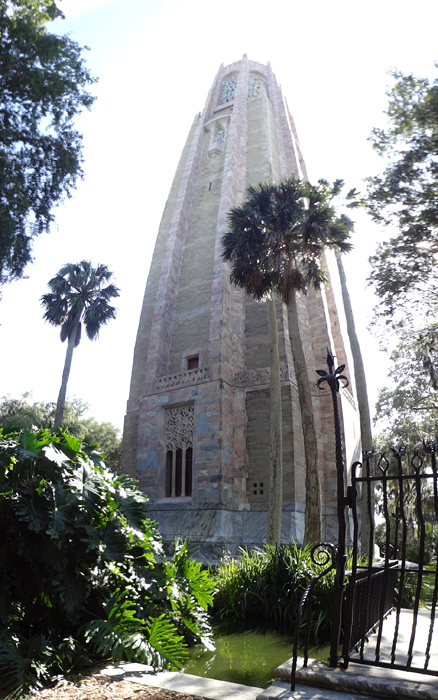 The Bok Tower, also known as the Singing Tower, is made of pink marble and coquina. 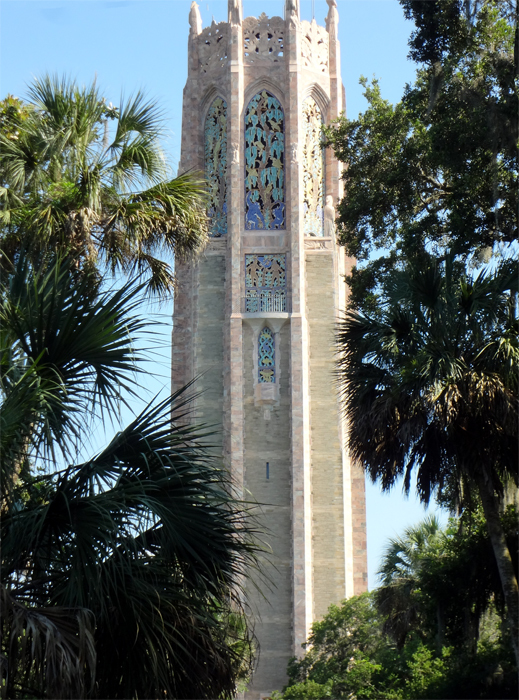 The 205-foot tall Singing Tower houses the 60-bell carillon. 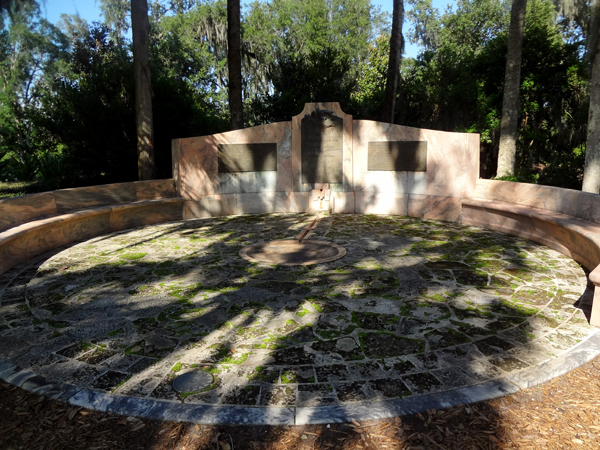 Sustainer level members and above are eligible to tour the Founder's Room on the grand first floor. 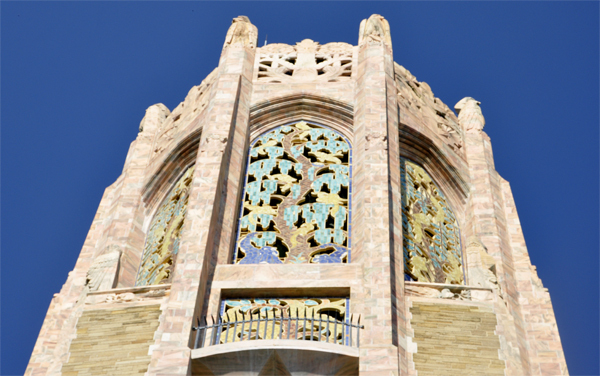 Regular visitors are not allowed inside the tower. 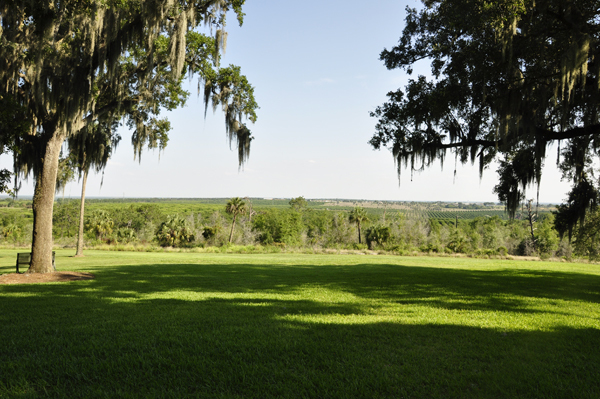 The area below is known as the Live Oak Grove. 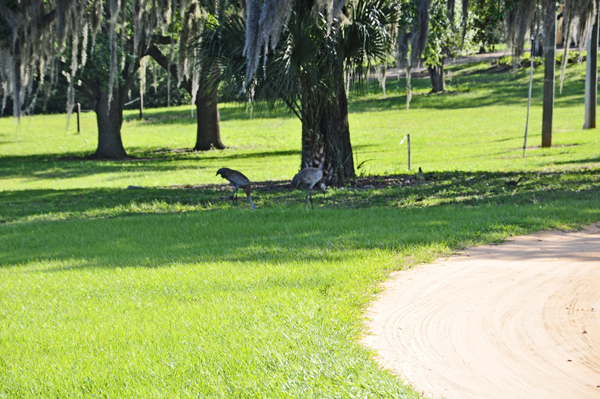 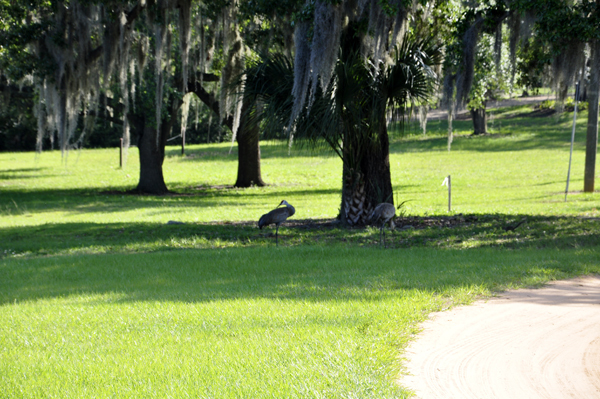 These stately oaks were planted when the Gardens first began. 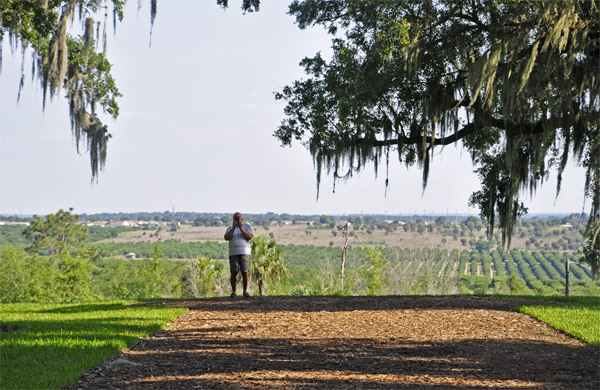 Distant vistas overlook rolling hills of citrus trees. 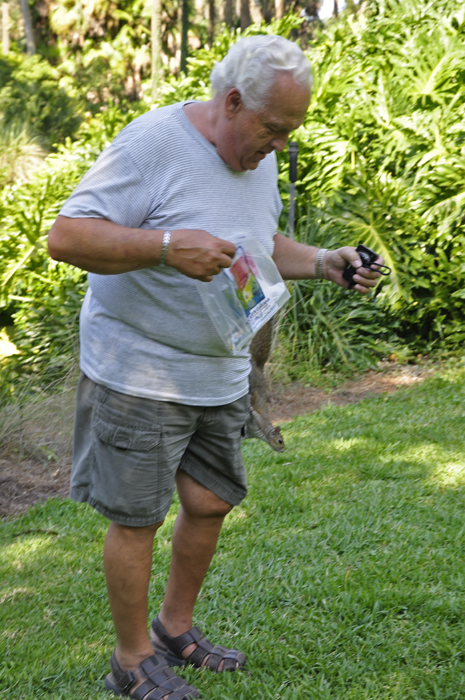 Lee (shown in the photo above) took the photo shown below of Karen Duquette as she walked towards the Live Oak Grove area. 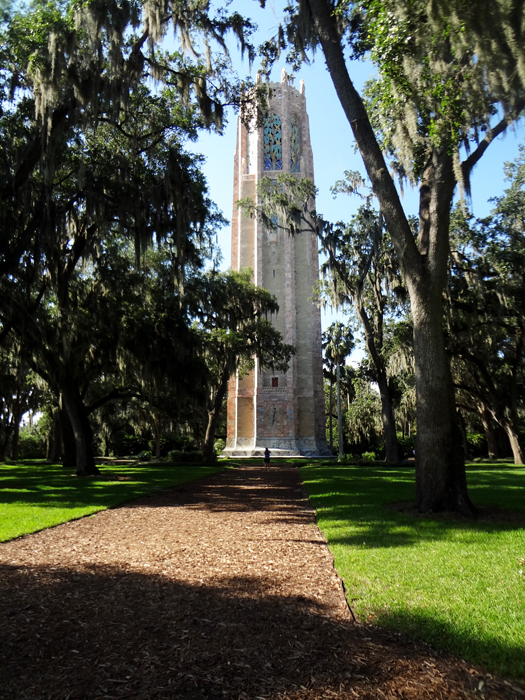 Below is a view of the Singing Tower as seen from the Life Oak Grove area. 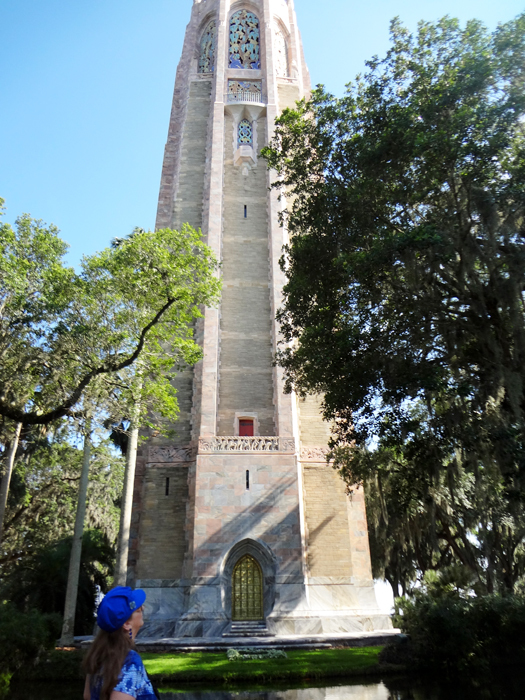 Lee took photos of the Singing Tower using a panorama camera and aiming upwards. 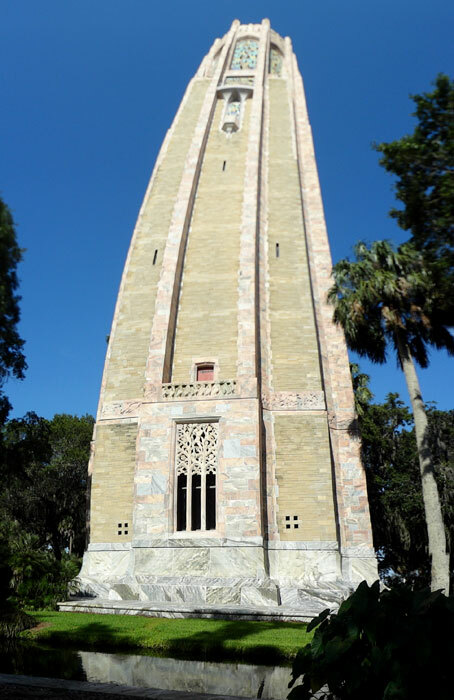 The result is a warped or curvature image of the tower. 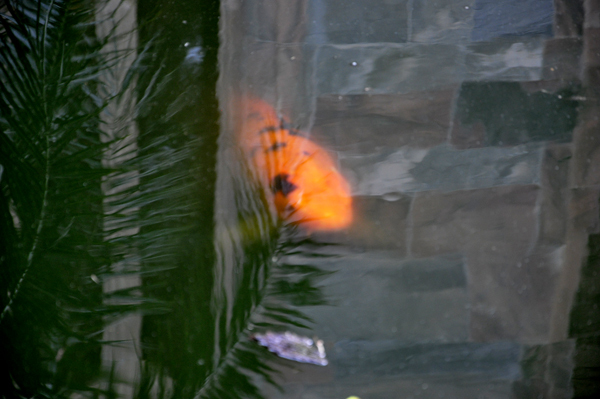 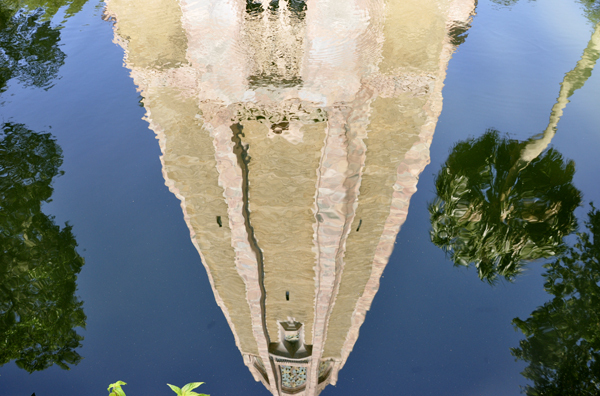 As Karen walked around the Singing Tower, she noticed the reflection of the tower in the water that surrounds the tower.